The Janus Phoenix 250 is a proud descendant of the quick, lightweight, and agile cafè racers and Grand Prix bikes of the mid-1900s. With a slender stance and aggressive rake, it carves city streets with ease and rockets nimbly through the countryside. Stripped away is any superfluous feature; the peppy, bulletproof engine and simple controls remain. The Phoenix is properly powered to provide heart-pumping thrills in an everyday setting, with a timeless style that turns heads whether it’s parked at the local cafè or racing down your favorite country road. Questions about how we do things? You don’t need loud pipes to turn heads with the Phoenix 250. We’ve built our business around keeping the human element in each motorcycle, merging the best of custom building with modern manufacturing. The result is a motorcycle that avoids the quirks and pitfalls of custom one-offs, but retains its one-of-a-kind soul in a market of one-of-a-million machines. Heart and soul are built into every Phoenix 250. The Phoenix 250 is no replica, but its design is inspired by the some of the best in motorcycling history. Starting with the classic featherbed frame, the Phoenix eschews extra plastic and bodywork while taking classic styling cues from the british cafe racer tradition and the Grand Prix bikes of the 50’s and 60’s. Our builders’ touch is noticeable throughout, from the hand-formed aluminum tank, to the hand-bent and welded frame, to the pinstripes. Small, lightweight motorcycles have distinct advantages over the over-powered, unwieldy, and large motorcycles that are so popular today. The Phoenix weighs 265 pounds, and our single-cylinder 229cc motor provides the get-up-and-go the nimble Phoenix needs. Modern disc brakes and stainless brake lines provide incredible stopping power. The result is a perfect pairing of size and power that gives riders exactly what they need for the kind of riding they love most. We began designing and prototyping our 250 series in early 2015. Watch the process from the very beginning! Even after the prototypes were complete, and production processes were in place, we've continued to make improvements. See what's next! Click an image below to learn more about the Phoenix's available options & upgrades. The Phoenix Stock Handlebars are designed for all-around performance in a variety of riding conditions and for improved comfort. These low-rise handlebars are slightly higher than Sport Bars and pull back further toward the rider for a more relaxed, upright riding position. The Stock Bars are made from stainless steel and come with a polished finished. The Phoenix Sport Bars are designed for a more aggressive, aerodynamic riding position. Weight is shifted more to the front wheel and steering response is improved for cornering and more sport-oriented riding. The Sport Bars are available with a black finish. The polished exhaust is crafted from stainless steel with a full polished finish, providing the bike with a more refined appearance. Both brushed and polished exhausts feature a black heat shield. The stock exhaust is crafted from stainless steel with a simple brushed finish, giving the bike a raw look and feel. Both brushed and polished exhausts feature a black heat shield. Read some of our customers' experiences riding and owning a Janus Motorcycle! "Getting to chat with everyone at Janus and test ride their products was amazing, especially after seeing the way they pour their hearts and souls into their work...This kind of spirit of customer service and entrepreneurial passion is awesome, and they bring it to life with surprising power, just like their bikes (which have a surprising amount of acceleration, by the way). You will not be disappointed!" "A bike that conjures up the joy of motorcycling isn’t the sharply-aerodynamic, grossly-overpowered modern motorcycle; it’s a bike like the pared-down Halcyon or Phoenix that creates an experience for the rider, an evocation of a simpler time." "My overall impression of both motorcycles was they are a blast to ride. Light and agile are great attributes, whether for inner city commuting or blasting down the back roads. The engine was up to the challenge..."
We've got your back. Janus motorcycles are covered with a 2-year powertrain warranty (unlimited miles), and a 2-year limited fender-to-fender warranty. We're small, and we're motivated to make every Janus owner a proud and happy one. We've built our bike in a way that's simple to understand and work on, and are available to talk through any concerns you may have. Each motorcycle comes with an owner's manual that outlines routine maintenance. Contact us for warranty fine print and information about service. 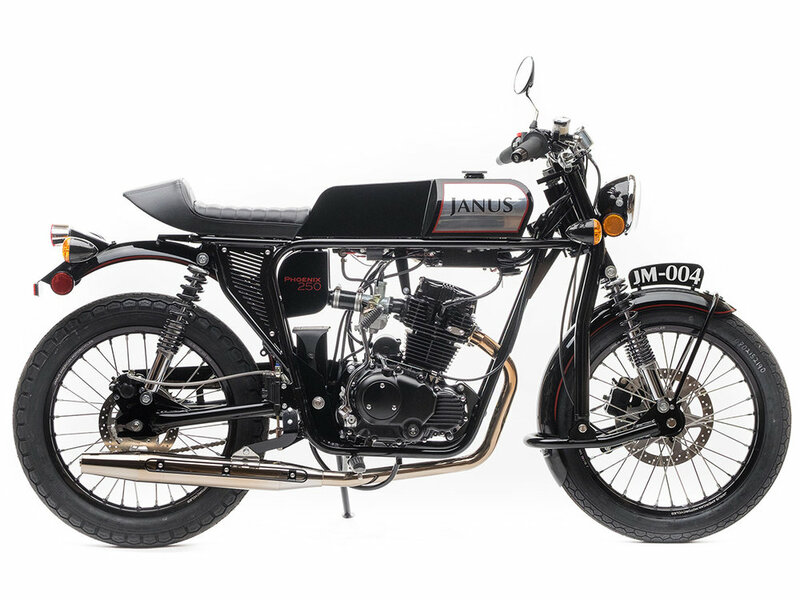 Ordering a Janus Motorcycle is easy. 1. Place your deposit online to reserve your spot in our production schedule. You're also welcome to call our shop during normal hours at (574) 538-1350 to speak with one of our team and place your deposit over the phone. 2. We'll contact you to help you choose your colors and options. 3. We'll maintain contact through your build process to share production updates and arrange pickup or delivery. 4. The remaining balance is due upon completion of the motorcycle. 5. You get your keys, get your bike (with gas in the tank), and get out and ride! We strive to maintain close contact with customers to ensure everything goes smoothly throughout your ordering and ownership experience. Have more questions about our ordering process? Click to read our FAQ page.